Studio and Garden: Early American Portraiture: Paint Becomes "Thing"
John Brewster Jr., John Colley and Martha Colley, ca. 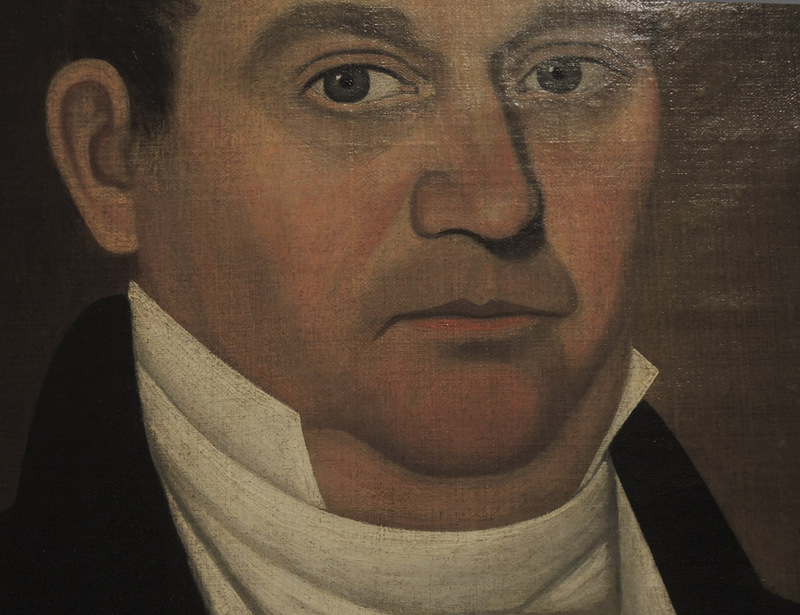 1820; oil on canvas. There is a quality in early American painting, especially seen in portraits, that fascinates me and elucidates my own work. 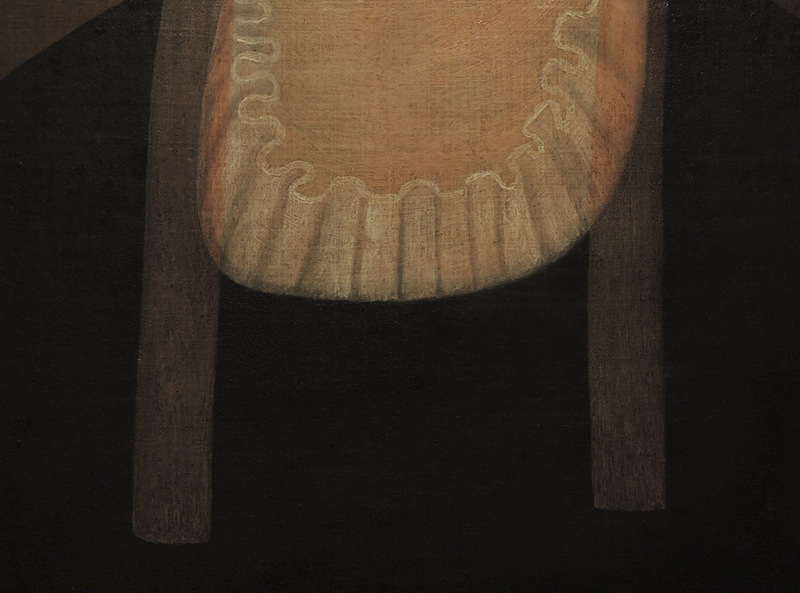 In these works there is a precise rendering of form using quietly descriptive paint; the form is magically tactile, becoming the thing rather than simply representing it. 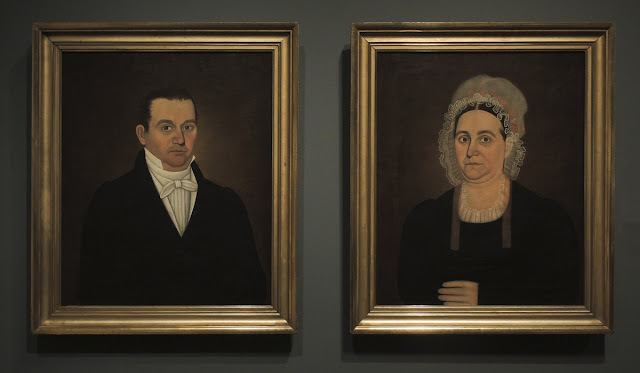 On a recent visit to the Hood Museum of Art I saw this pair of paintings that are fine examples of American itinerant portraiture. 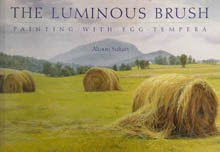 From the wall label I learned that John Brewster Jr. was a deaf mute who studied with the portrait painter Joseph Steward, and then traveled around New England, painting more than 100 portraits. The portraits of the Colleys are beautifully rendered, with a restrained hand and delicate sensibility, and they have a vivid presence. 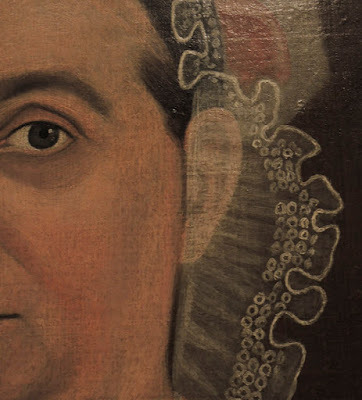 When I look at this detail of the portrait of Martha Colley, my eye travels over the crisp clear forms of facial features––moving forward and back, up and down––as though my finger was tracing the volumes. The paint transforms into gathered lace, transparent yet solid. Her direct gaze enhances the sense of a physical presence. This is a detail that I love: the ear showing faintly through the lacy cap border. Transparent ribbons lie over a ruffled neckline. 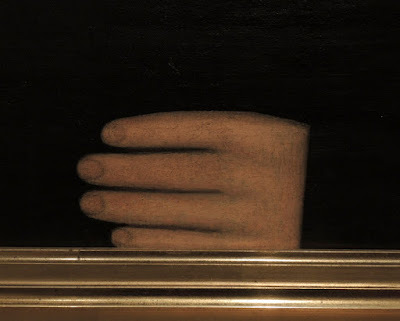 Martha's hand rests on the edge of the frame, which makes me thing that Brewster may have seen reproductions of earlier European paintings that use the same device, such as this portrait by Rogier van der Weyden. 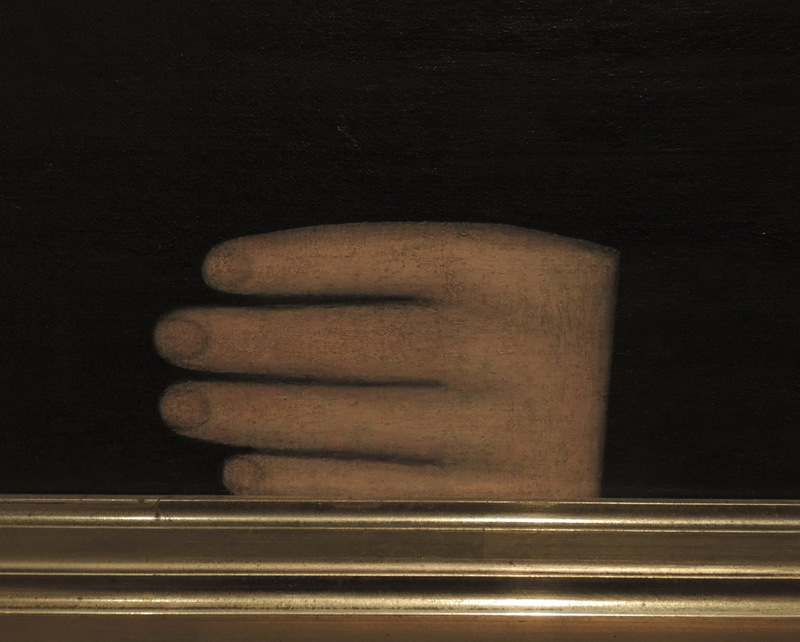 The hand in this painting is generalized, the fingers round cylinders; it is a primitive evocation of the idea of hand. 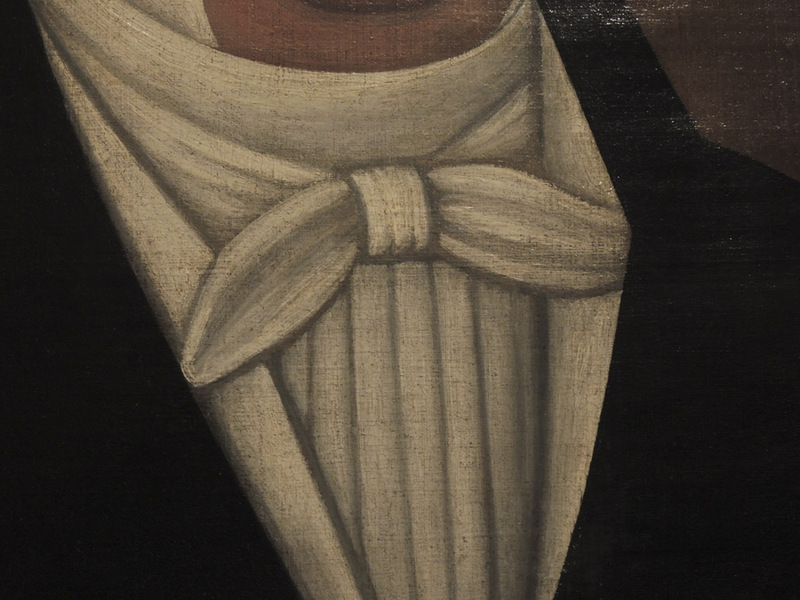 In the companion portrait of John Colley, my favorite passage is this collar with its precisely rendered bow and its vertical folds; they are painted in a sculptural manner: my finger can fit behind that ear of fabric. John's gaze is more resolute than that of his wife, but his facial features are similarly described with crisp outlines and sculptural volumes. The form feels real, feels solid; at the same time I am aware that there is a primitive quality of "thingness", where the concept of this man becomes an actual one in paint. 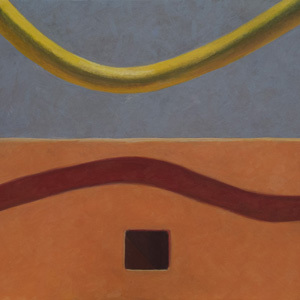 I so strongly relate to this work because I have a desire, in my paintings, to also achieve an uncanny sense of tactile presence on a flat surface. I have always been fascinated by this type of portrait. You have put into words the things I have seen. They are marvelous, aren't they? I'm glad you liked the post, Lisa. Marvelous, expansive post. You always makes things more tactile for me: thanks! 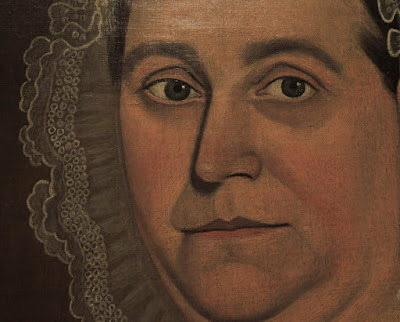 Yes, poor John and Martha, now she has the lot of us running our fingers over your virtual-faces. You've been objectified! Thanks, Altoon, for making us see (and feel) these things. You're very welcome, JBS; I enjoy thinking and writing about this. Disciplined-thinking, expressed - a joy to behold.